Traditionally, intelligence, surveillance and reconnaissance sensors have been hulking antennae and big boxes that often need to be bolted into place. But researchers from Harvard and the Air Force want to shrink those sensors down to the size of a Band-Aid, creating a new world of possibilities and sensor applications. For example, imagine a sensor whose electronic components have been digitally printed into a thin, bendable, stretchable sheet of elastic material. “If you can write those electronics right onto that material, you get the ISR capability without adding any new weight,” said Mike Durstock, Air Force Research Lab (AFRL) branch chief for the soft matters materials branch. Researchers from AFRL and Harvard University’s Wyss Institute for Biologically Inspired Engineering say they’ve developed a way to do just that. They described their technique this fall in the journal Advanced Materials,and are developing practical applications for the technology. The Air Force envisions a range of possible uses for these flexible sensors. Slim elastic strips could replace bulky boxes on aircraft, where space and weight are always at a premium. They could also ease the maintenance burden. “Look at the bladder of a tanker. The maintenance around that is highly involved, it requires several folks removing the bladder from the aircraft and looking for a leak. If you can put flexible sensors onto the bladder system, that can reduce maintenance costs and shorten that maintenance cycle,” said Dan Berrigan, a senior materials engineer from AFRL’s Materials and Manufacturing Directorate. Other military services could benefit as well. Researchers are looking at infantrymen, for instance, and the ways in which flexible sensors could augment their performance. Printable electronics might extend beyond sensors: Researchers are exploring the possibility of using elastic-medium printed circuits to generate power in novel ways. “We could take a high-performance solar call and wrap it around the aircraft wing in order to utilize more of the surface area to supplement battery power, or we could use the flexible material to embed a battery into a wing,” Berrigan said. That transition is likely a few years off. The AFRL team says 3-D printing will have advanced sufficiently to generated “printed” electronic components within a year, but there is still some materials-science work to be done on developing an elastic medium. In their published results, the researchers used a 3-D printer to trace out a conductive, silver-infused thermoplastic polyurethane, setting microcontroller chips and LED lights into a flexible substrate. 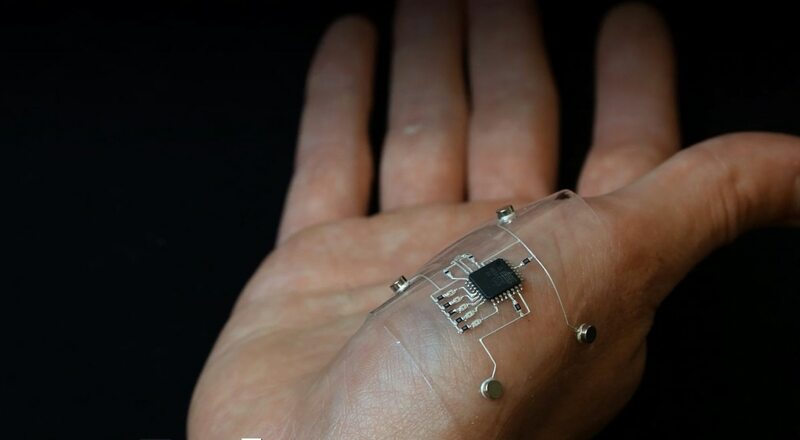 “This is the first time a 3-D printer has been shown, in a single process, to print stretchable sensors with integrated microelectronic components,” said Dan Berrigan, a research scientist at the AFRL Materials and Manufacturing Directorate. “Starting from nothing, the printer builds an entire stretchable circuit that blends the mechanical durability of printed components with the robust performance of off-the-shelf electronics.” In this demonstration, a 3-D printer was used to print conductive traces of flexible, silver-infused thermoplastic polyurethane. A pick-and-place method was then used to set microcontroller chips and LED lights into the flexible substrate, augmented by an empty printer nozzle and vacuum system to create the hybrid system. The end product was able to maintain function even after being stretched by more than 30 percent from its original size.